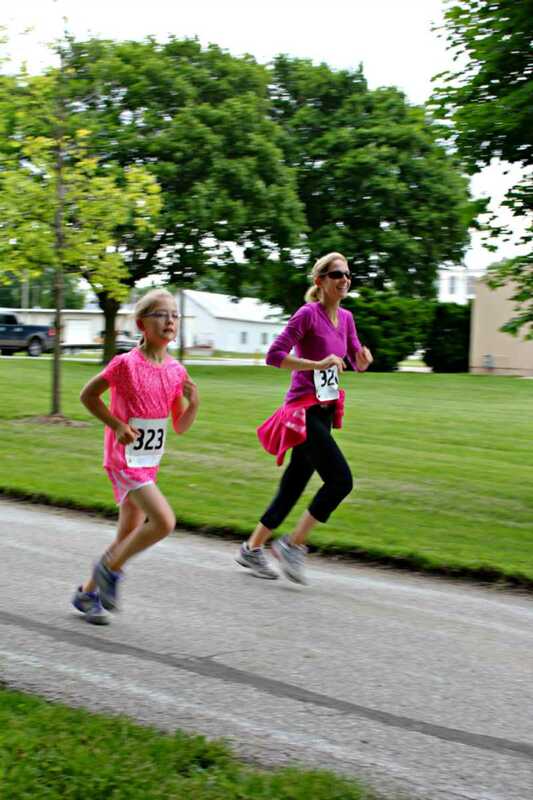 Last weekend, Alivia ran her second 5k in my hometown of Shelby, Iowa. We drove out the night before and stayed with my parents in their home that is the midst of a total renovation. It was bananas there. I was so tired (as I worked Thursday night, stayed up all day Friday and then drive to Iowa to stay with my parents Friday night) that I could have slept on a rock and would have not known the difference. Anyway, we woke on Saturday morning to a chilly one. Alivia was nervous. Funny, when I run with Alivia, the pressure is off of me. :) We had to ride to the starting line and just froze. They then went back to get more people and we froze some more. The race started 15-20 minutes late. Alivia and I were so cold! The run itself was more of a challenge this time as Alivia has not been running as much as she should have been. The run was on a beautiful trail through town unlike anything we have here to run on. It was so pretty. As we approached the big hill at the end, I told Alivia to empty her tank. She just took off passing people up the hill. She finished in 28.50! Impressive for a 9 year old little girl. She did amazing. For now, Alivia is taking a break. She loves to run, and vows to keep on running.